Mexican Chicken Soup With Cilantro Dumplings: The perfect soup to serve before a Mexican meal or as a main course. 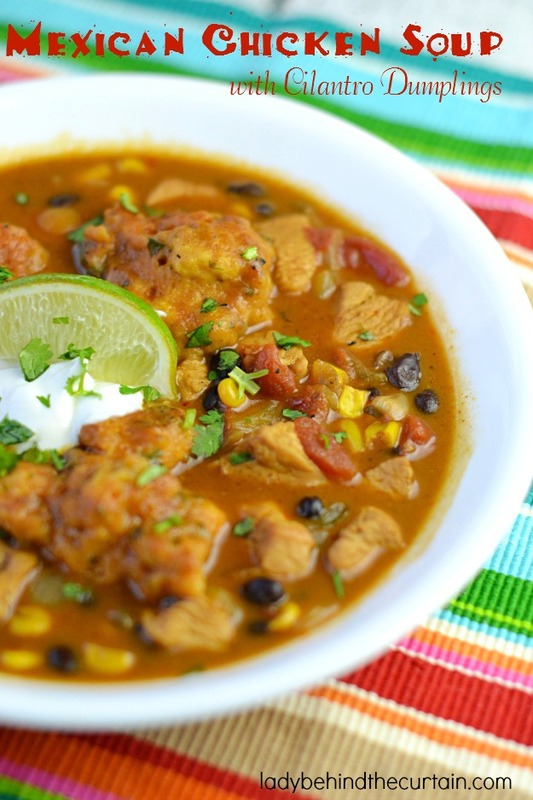 This light recipe will warm your insides while satisfying your Mexican food cravings. With the perfect balance of chicken and spices. Plus the treat of cilantro dumplings you will be totally satisfied. 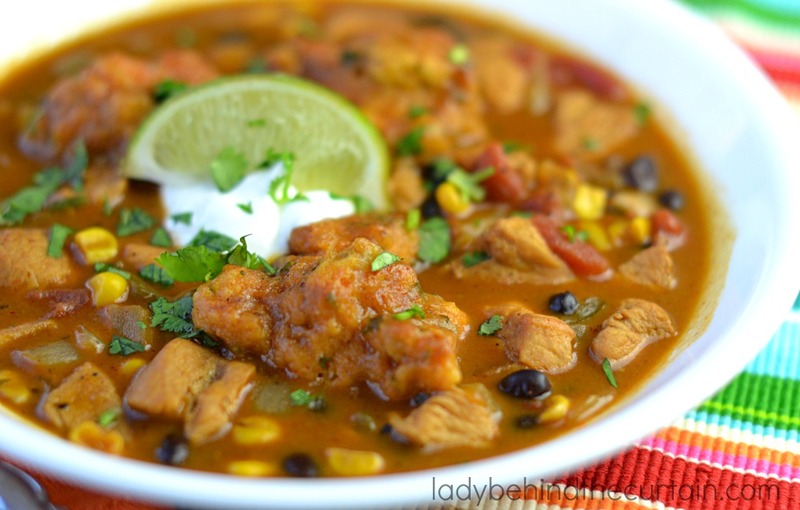 This soup is really easy to make but offers layers of delicious flavor. Perfect for any Cinco de Mayo celebration. 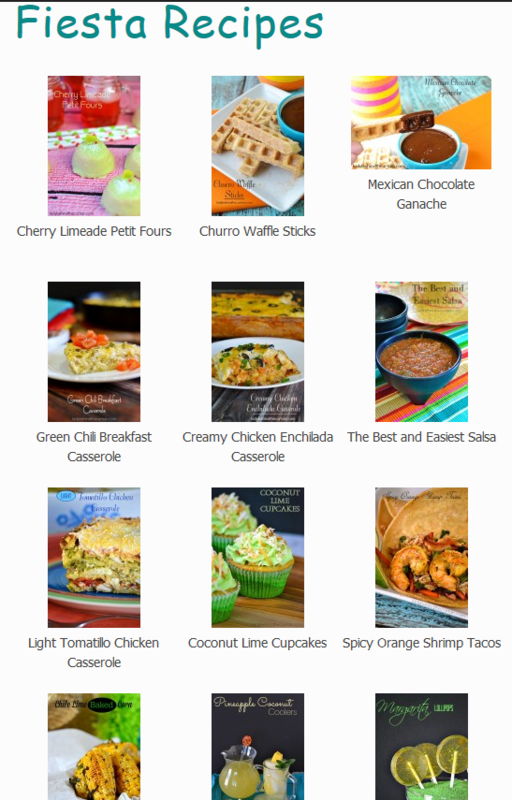 Choose any of my over 70 recipes from my Fiesta Category. In a Dutch oven, saute chicken in 1 teaspoon oil until brown and no longer pink. Remove from pan into a bowl. In the same pan, saute onion, chili powder and jalapeno in remaining oil until onion is tender. Return chicken and dd the broth, tomatoes, beans and corn; bring to a boil. In a small bowl, combine the biscuit mix, cilantro and cumin. Stir in milk just until moistened. Drop by tablespoonfuls onto simmering soup. Cover and simmer for 15 minutes or until toothpick inserted in a dumpling comes out clean (do not lift the cover while simmering). OK dumpling scare me… I like the biscuit mix cheat. I might be able to make this. Thanks for sharing it on foodie friday. Sheryl, this looks absolutely delicious! I love the cilantro dumplings. What a great addition to the soup! Oh you had me at cilantro dumplings. What an awesome idea! The soup sounds great. Definitely one to try one day! Thanks Julie, It’s super good and even better as leftovers. 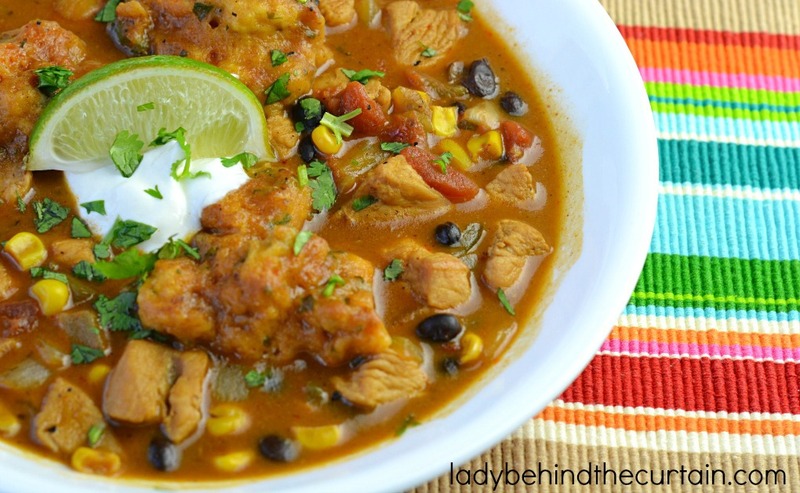 As someone who loves soup and Mexican food, you hit the jackpot with this combo! Love it!